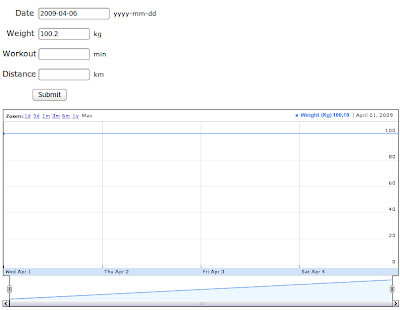 I've put together a web site to track my weight and exercise. But mostly it's to play with Google App Engine. The Google Visualization API. It's a very neat way of putting up charts easily. One nice feature is the separation of data to data views. You can, for instance, download (via AJAX) one table with six columns and produce 5 charts from it with 5 views, very neat. You can use some libraries for free (i.e. it's doesn't count for your application's quota, and you get updates without having to manage it). For my app I used the dojo library. I figure the more of these web application I make the easier it will become. I'm not going to do an app a week like Web App Wednesday, but Google's sure making it easy to put up a site.